Availability Calendar At Bottom Of Page. Some units have dormers as seen here and other do not but are all basically the same interiors. this recently built cottage at Chandler Point is for you. within minutes of Haliburton Village. No matter what you are looking for, this cottage has it. freezer, stove, microwave, coffee maker, toaster and dishwasher. There is a separate dining room with seating for 8 for your dining pleasure. TV / VCR, satellite dish and games table. In addition there are 2 bathrooms, one 4 piece and one three piece with standup shower. which features 5 other similar cottages to the one pictured above. and Sir Sam's Ski Resort is within 20 minutes of this cottage. 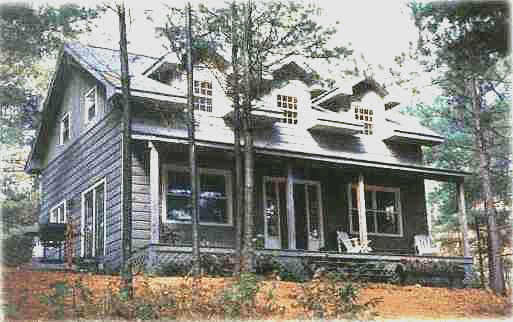 and looking to be pampered during your winter vacation, this cottage will certainly not disappoint. Smoking outside only if you please. Call at your convenience to book these outstanding properties.